Today I’m sharing a very simple recipe that I experimented a while ago and which turned into the most wonderful and extraordinary tart, a Fruit Date Tart with Custard Cream filling. The tart shell is rather soft and not crusty, as it would normally be. And if well stored, you can keep the tart shells for a few days, which means they can be prepared ahead of time. And while you can prepare any filling of your choice, I opted for a light and delicious custard cream filling that suits the tart perfectly. As for the fruit toppings, they can be any of fruit of your choice, but for me, Raspberries, Blueberries and Pomegranate seeds felt to be the perfect choice. Not only they are wonderful companions of custard cream in general, but they also taste great with this particular tart, and they provide the tart with beautiful and balanced vivid colors. 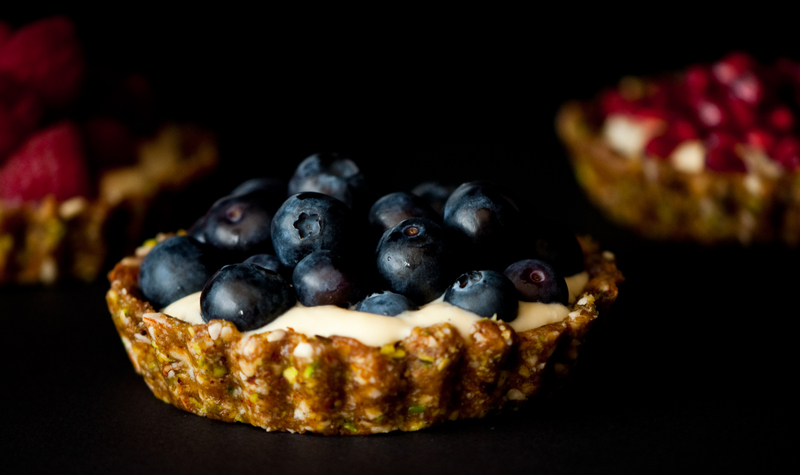 For the tart shells: pour all ingredients, in a food processor. Process untill mixture becomes ground and crumbly. Using the extra olive oil, grease the base and sides of 6 10-cm spring tart tins. Then divide the date mixture among the tart tins making sure to spread the mixture as smoothly as possible to cover the base and sides of the tin. For the Custard Cream filling: Mix the milk and vanilla extract in a small pan, over medium heat. Stir continuously. Bring to a boil then remove from heat. In a separate bowl, whisk the egg yolks, sugar, and corn starch using a hand-held electric mixer. Keep whisking till mixture is smooth and pale in color. Pour the milk gradually over the egg mixture stirring continuously. Pour the mixture into a clean pan put over low heat. Continue to stir till custard gets a thick and smooth texture. Remove from heat and pour into a clean bowl. Cover the custard with cling wrap and refrigerate till ready to use. 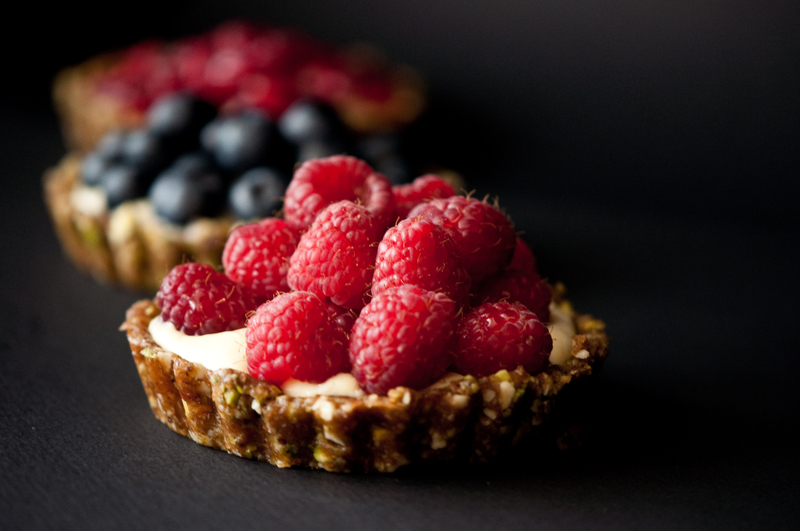 When ready to serve the tarts, whip the double cream till it becomes light and fluffy. Add the whipped cream to the custard and stir gently till custard cream is smooth. Gently remove that tart bases from the tart tins. Divide the custard cream among the date tarts. And top with your choice of fruits! Indulge!